Fender launches two new Bluetooth speakers | What Hi-Fi? Styled after the firm's iconic guitar amplifiers, the Newport and Monterey let you stream tunes from your phone and take handsfree calls. 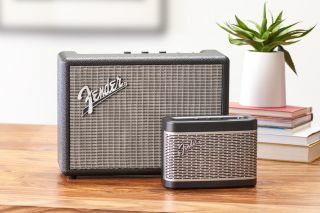 Fender, the firm best known for its electric guitars and professional-level amplifiers, has launched two new Bluetooth speakers. Both the Newport and Monterey are styled after Fender's iconic amplifers, and promise to free tunes from your phone. The Monterey is the higher-end model. It packs 120W of power, and boasts two woofers and two tweeters. Bluetooth aptX is on board for higher-quality streaming, it supports the AAC wireless audio codec and has a 3.5mm auxiliary input jack plus a pair of RCA jacks - so you can hook it up to a preamp. The built-in mic has echo cancellation, which should make for clearer phone calls. The Newport is less powerful, with only 30W channelled through two woofers and one tweeter. It has all the same features as the Monterey, plus a USB port for charging your smartphone. Both feature "one-of-a-kind" audio cues that sound when you power them on or pair them over Bluetooth. The Monterey costs £300 and the Newport is £190. Both are available now - our review of the Monterey will appear later this month.